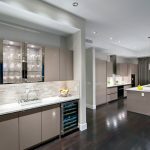 Kitchen Cabinet Ideas in Calgary | Bow Valley Kitchens Ltd. Custom cabinets offer homeowners an absolute diverse range of design options. Different cabinet styles, materials, colours, tones, sizes and more can be selected to create your perfect cabinetry system. Don’t let the bulk of design diversity become overwhelming when planning your renovation or new build project. Consult with a professional for guidance and assurance. At Bow Valley Kitchens, we specialise in helping homeowners find and receive their perfect cabinets. We have years of professional kitchen cabinet design and installation experience. Visit a showroom today for more ideas and inspiration. These cabinets help promote an inviting yet masculine feel in the kitchen space. Soft colours and natural materials mix with planked-panels to offer a fresh and rustic feel all in a single cabinet style. Distressed or faded cabinets can be ideal for promoting a relaxing and time worn look. Distressed finishes are made laying a light colour tone over a darker tone. The lighter tone is then buffed and scrapped to provide the worn and fading look. Stained pine cabinets provide a natural and coastal feel. These cabinets can be ideal for kitchens that have large amounts of natural light as well as steel or iron appliances and accents in the space. A white kitchen space can benefit from the fresh turquoise hue. Cabinet boxes, backsplashes or furniture can be the ideal location to offer a punch of colour into your white kitchen. Raise lower cabinet off the floor for a more efficient, clean and modern look. Raised cabinets don’t allow crumbs to pile up, and the pieces used to raise the cabinetry are great opportunities to use an accent material. For example, rich wooden cabinets raised off the floor with steel posts balance perfectly to create a modern yet warm environment. For boathouses and coastal homes or for homeowners who love travelling and the sea, porthole cabinets can be ideal. Cabinets installed with small portholes help make the space feel like the galley on a boat. This feeling can be further promoted, with coral accent pieces, a kitchen ladder and nautical art. When kitchens are largely wood panelled, have wood floors and tan countertops, a more sharp or cool element can be required to complete the space. Consider using steel cabinet drawers, appliances and handles to create a more balanced space. This cabinetry takes the similar ideas proposed by distressed cabinets to a whole new level. Applying paints and scraping techniques that mirror a fading or tattered fence can create a truly relaxed and yet beautiful cabinetry design. Modern kitchens that still want to feel inviting and natural can consider striated cabinetry. Striated cabinets resemble wood graining though are man-made. These cabinets can look soft and help create a level of warmth, while still promoting a sleek design in the modern space. Wire brush oak cabinets provide a rich sense of comfort that can work perfectly with more modern and upscale spaces. The oak provides a rustic and comforting feeling, while stone and metallic floors, pieces, and appliances help create the upscale and sleek look in the space. Chicken wire works similar to glass panels. The wire replaces the wooden panels to create a more airy and relaxed feel in a rustic kitchen space. As the chicken wire is a barn-item, these cabinets can best suit country or rustic kitchen designs. Kitchens that aim for bold colours can look stunning when lacquered. A lacquered coating creates a high gloss finish in any coloured kitchen cabinet. These kitchens can be energetic, bright and happy. Glass panels showcase what’s inside the cabinets. This airy design helps display your gorgeous dinnerware or your beautiful martini glasses. LED light strands can be installed to brighten up the interiors of the cabinets and make the contents shine! Soft, white and framed cabinets help promote a traditional Belgian style. These cabinets can work well with natural wood tones or other soft colours. These are especially ideal for highlighting the natural beauty of the kitchen space in a home that otherwise promotes bright colours. Siding cabinets are made of natural woods and are often hand crafted. These luxurious cabinets are a traditional Japanese style. The wood tones are best showcased in a kitchen space that has an abundance of natural lighting. Trimmed cabinetry helps create a consistent design feel in any kitchen space. A colour trim around a cabinet panel can work in cooperation with similarly coloured backsplashes, furniture or accent pieces to help brand the space. Cabinetry that is made more attractive with unique custom designs, gold edging, or other luxurious features are referred to as embellished. Embellished cabinetry is ideal for upscale, colonial kitchen spaces. Grey cabinetry can be effectively fitted and surrounded with stainless steel elements to craft a true “maritime kitchen design”. This cool and sleek look is ideal for spaces that offer large amounts of natural lighting as well as stone flooring and or backsplashes. Glass front cabinets offer an airy and clean feel in the kitchen space, Incorporating curtains behind your glass panels adds a burst of colour and texture and can conceal any cabinet clutter. Opaque glass can be ideal for homeowners looking for an airy cabinetry finish but still, want to conceal the cabinet contents. Wooden elements, tile floors, grey cabinetry and opaque glass can come together with metallic appliances to create a popular modern kitchen design. A blue room is unique and can be very bright with the right accenting design elements. Sky toned blue cabinets, with white countertops and or backsplashes, coupled with stainless steel appliances allow for the burst of blue colour to still feel light and fresh in the space. Utilising contrasting colours for your cabinets and hinges is a more subtle way to provide balance and contrast in your kitchen space. White raised cabinetry, with dark hinges can help create a country and rustic feel. While light hinges on grey cabinets help encourage a more natural and sleek design. Cabinet without handles, hinges or drawer slides are extremely effective in slowing down your kitchen space. Offer hardware free cabinets in a modern space to promote a relaxed feel. Mahogany cabinetry employs a dark, rich and red toned wood. The cabinets create warmth and can be best suited for low-light kitchens. Stainless steel appliances and white countertops can help the natural wood tone pop out. Mahogany cabinets are often used for traditional kitchens and traditional cabinetry. This is a unique and luxurious cabinetry design idea. Mirrors help promote more light, offer the feel of extra space and are completely eye-catching for guests. Milk paint cabinets are made with tones selected from The Real Milk Paint Company. This is a Scandinavian style that offers a blend of faded cobalt colours. Orange cabinets are largely reserved for modern kitchen spaces. In combination with matte black, glossy orange can add a burst to drama or warmth in the space. A burnt orange colour can work perfectly in largely white spaces to add some colour and character to the space. These cabinets are commonly used with white floors, backsplashes and countertops. This is the ultimate form of cabinetry contrast. White and black blend together to make a statement. Cabinets can use two panels in a single cabinet door. This creates a more textured and cosy feel. Panels can be used in any colour scheme and with any wood tone. Designs for adequate kitchen storage can be a daunting challenge, Installing “sky high” cabinets that are out of normal reach can be ideal for storing kitchen items that are only used at select times in the year. With high cabinets, you can save the rest of your kitchen space for appliances and countertop space. Plank cabinetry panels that are frames and light help create a bright, welcoming beachfront feel in any kitchen space. 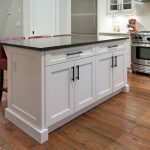 Contrasted with dark cabinet handles or hinges, these cabinets can be truly unique. Navy blue cabinets are a classical colour. Though when used in flat-panel overhanging cabinets, this colour can work perfectly in a modern kitchen full of metallic appliances. In a similar fashion to distressed cabinetry, weathered wood utilises scraping and buffing techniques to create a worn and aged look. Weathered wood, rather than aiming for a tone, provides the distressed look directly into a natural wood tone. Bright green or coloured cabinets are ideal for stone countertops that have multiple colours. For example, a white marbled top, that has hues of green marbling, can use bright green cabinets to help the stone pop. High gloss white cabinets are ideal in white kitchen spaces. Together these can make the brightest and cleanest designs possible. Small colour bursts from chair covers; fruit baskets or candles can easily stand out in the spaces. Cabinet doors can be installed onto the dishwasher and fridge doors. This doubles in getting the most from the overall cabinetry designs and in covering the appliances to make the room feel more like a place of relaxation rather than a workstation. Solid Walnut cabinets are entirely made from the wood. These cabinets offer high levels of design consistency and a very natural feel in the kitchen space. When made frameless, these can be best suited to a modern kitchen space. Accessorised cabinets are often crafted without doors or boxes. These shelf-like cabinets are usually full of a number of kitchen accessories. This is a very airy cabinetry design. For kitchen spaces that are taller than they are wide, stacked, ceiling height cabinets can be ideal for ceiling the design of the space and for offering increased kitchen storage space. Wood made from past furniture can hold sentimental value and can be reused for cabinets. Old bed frames, dressers or shelving units can often be salvaged to create new cabinets. For kitchen cabinet ideas and styles contact Bow Valley Kitchens Ltd. and visit one of our luxury kitchen showrooms in Calgary or Canmore. We have a number of different styles to inspire your future kitchen project.